In early 1997 Maccaferri designed a 30m high Terramesh System wall that represents the centre-piece of the mineral concentrator facility within the Batu Hijau copper and gold mine located on West Sumbawa, an island in the West Nusa Tenggara Province. After 20 years, this Mechanically Stabilized Earth (MSE) wall still stands out and represents a key feature of the mining facilities. The Batu Hijau mine is an open-pit copper and gold mine now operated by Amman Mineral PT Nusa Tenggara. When the project was started 20 years ago, the mine was owned by PT Newmont Nusa Tenggara. The mine is located on West Sumbawa, an island in the West Nusa Tenggara Province. In 1997 PT Newmont Nusa Tenggara was completing the construction program ahead of operations starting at the mining site. A mineral concentrator was built to process the excavated ore and a significant Mechanical Stabilized Earth (MSE) structure was required to support the facility. In order to select the optimum Maccaferri reinforced soil wall solution, key considerations that needed to be taken into account were: limited and difficult site access, significantly uneven ground, lack of local construction material, shortage of skilled labour and wall verticality. It was also a requirement that the structure needed to be earthquake-resistant. 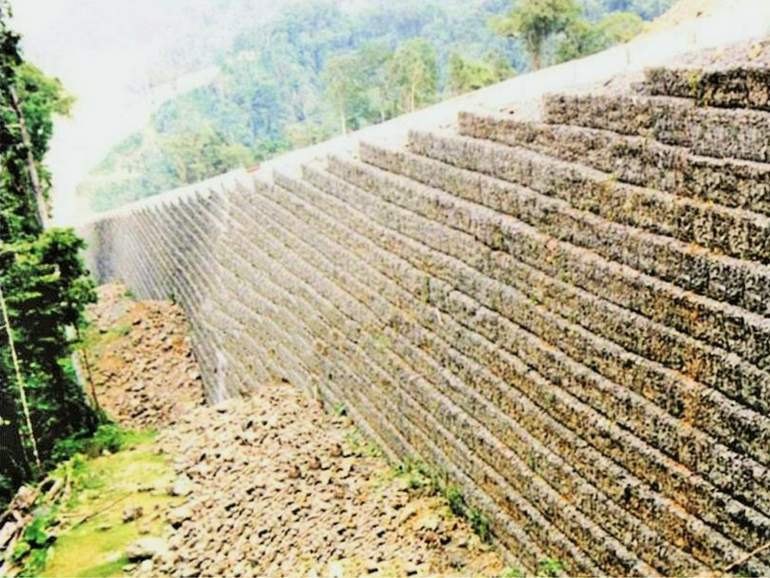 Maccaferri Indonesia proposed to the designers, PT Fluor Daniel and PT Golder Geotek Utama, its Terramesh System to build a 30m high vertical MSE wall. Maccaferri’s MacStars software was extensively used during the design process. The structure was completed in less than 12 months. Over 3,400 m² of wall face were built with an average installation capacity of 50 m²/day. The Terramesh System that was used to construct the wall consists of gabion fascia elements with an integral geogrid tail. Soil backfill is compacted in layers upon the geogrids which reinforce it. The geogrids within this project extended 23 m back from the wall face. Various maintenance tunnels located in the middle of the reinforced soil wall required specific attention during design and construction to ensure continuity of performance of the structure. We were also involved in a second Terramesh System soil reinforcement solution for the “Coarse One Conveyor” that was built from mid-1998 to early 1999. This facility was needed to move materials in the Batu Hijau site through some extremely hilly regions of Sumbawa. The same design issues that had previously been addressed at the Concentrator site needed to be overcome in the conveyor project. Furthermore, the site was set at a steep incline with both transverse and longitudinal slopes in the direction of the conveyor. This wall was around 600m long and was on average 10m high. The wall face exceeded 5,000 m². Over 20,000 m² of our non-woven geotextile was also used within this structure to prevent fine soils from permeating into the reinforced zone and contaminating the quality fill. The 20 years since construction have shown that even in these extreme mining conditions, our solutions are continuing to provide effective service and will continue to do so. For more information on our reinforced soil wall solutions and more, please contact us.